When I was a child my parents took my brother and me to a famous old toy store in London, and said we could pick any one item at a gift. I was torn between a die-cast James Bond Aston Martin with a working ejection seat… and the other item that caught my eye, a fully articulated hand carved marionette. I hope don’t lose some of my man-cred when you learn I ultimately picked the marionette and not the James Bond car. He hung on strings from multiple cross-pieces, and I spent much of that summer learning to make him walk and dance… and do battle with other toys in our playroom… hey, I was still a boy, after all. 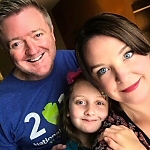 When I found there was a full-fledged Marionette theater right here in Dallas, I was thrilled to be able to introduce this awesome art form to our young daughter. The setting for the Geppetto’s Marionette Theater, an amazing space deep beneath the Hilton Anatole Hotel in Dallas, Texas, is almost otherworldly! As you go down the steps from the luxurious lobby of the Hilton Anatole, you feel almost as though transported to a time and place long ago. 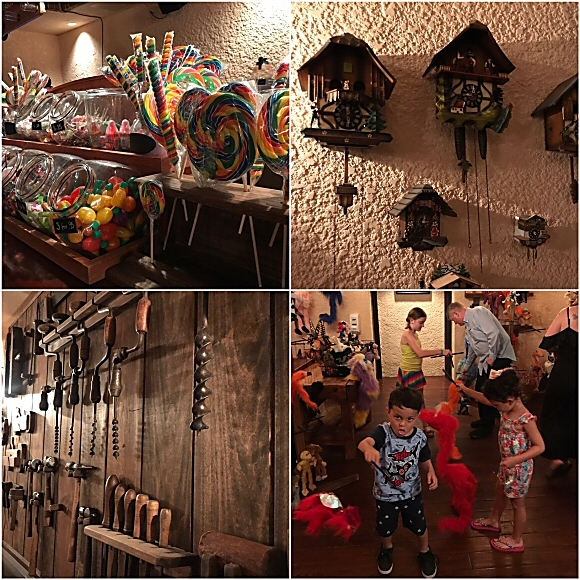 The arched brick ceiling and decor of the gift shop and concession area feel as though they exist out of time, perhaps someplace in the black forest, or a Grimm’s Fairy Tale? At showtime you enter the adjacent gorgeous little theater, and take your seats as the lights dim. If you’ve never seen a marionette show, it may be hard to imagine how truly magical the experience can be…. especially for kids. The skill of the puppeteers allows one to forget the ‘actors’ are on strings. I’ve had the pleasure of taking our daughter to shows at this theater since she was young, and she adores it! Visit their webpage geppettostheater.com to read about their different shows and party options. 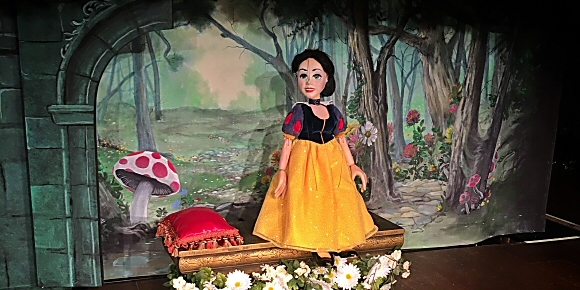 The new ‘Snow White’ show was awesome! At Christmas, I also highly recommend the Winter Wonderland show. 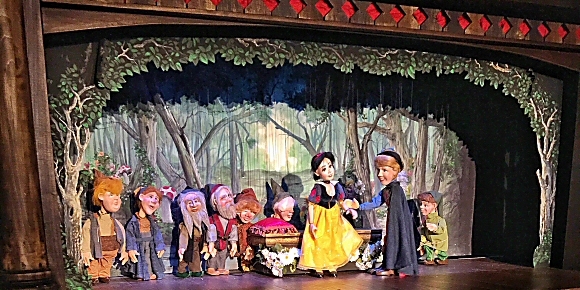 As you might imagine, the Snow White performance requires quite a few ‘actors’ on stage at once, e.g. seven dwarfs, Snow White and the prince, to name just a few. To breathe life into all of these characters there were 6 puppeteers managing all of those strings, and creating the magic for for kids of all ages in the audience! After every show they invite the children back stage to see how it all works and answer their questions. I firmly believe this theater has started a life-long love of stage performance for many a child over the years! And if you want, you and your kids can take home your very own marionette from their shop. Go check them out now at geppettostheater.com!